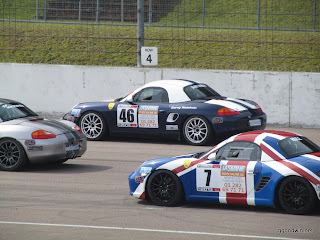 We arrived at Rockingham near Corby an hour before scrutineering on Saturday am. The paddock was full with many cars having tested on Friday and we grabbed the last garage space. Heading out for qualifying, I had knocking noises coming from underneath the car, so stopped at the end of the pit lane. After a minute thinking what to do, I decided it had to be stones hitting the underside of the car, which is amplified without sound deadening and so went out onto the track. On the cool down lap however, the noises were back and in the garage we found the handbrake mechanism had failed inside the hub. An easy fix with new springs from Jasmine-Porschalink (A new series sponsor who are providing a parts van at each event). 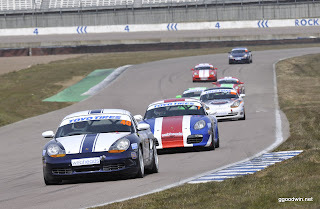 I got a good start and picked up places round outside of the first hairpin. The car felt good and I was looking for an opportunity on the car in front (5th place). That changed dramatically as a small mistake turning in too late let two cars through and then an over zealous right foot had me fighting over-steer and a tank-slapper on the exit to the main straight. Whilst I avoided hitting the wall, I lost momentum and was now well down the field. I got one place back a few laps later, but a trip over the grass under pressure gave that place and another away. I finished a little disappointed in 9th. 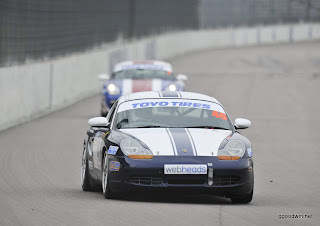 I started 9th, but found my confidence had disappeared following the events of race 1. I felt the car had no grip, my times were well down and I was struggling to stay ahead of the Class-B Boxster's. In hindsight my tyres pressures could have been too low or I hadn't got them up to temp on the warm-up lap. I finally got my act together increasing speed and confidence and with the help of a brief safety car lap joined the battle for 7th-10th places pushing them hard on the final couple of laps. On the last lap however, the gear lever mechanism failed as I braked from 125mph into the first hairpin, leaving me stuck in 4th. Not knowing what had happened, I took the safe option of the exit road and was towed back for my first ever DNF. Another trip to the Jasmine-Porschalink parts van to replace the plastic gear lever linkage which had worn out and we were quickly ready for the final race. I put tyre pressures up in an effort to abbate the drop in ambient temperature (evening was approaching) and also to make sure I had good grip immediately. I worked really hard on the green flag lap to get temperature into the tyres. I started 6th on the grid based on my 2nd fastest qualify time. Whilst I lost out a couple of places initially I was lapping in 1m43s immediately, keeping up with the cars in front despite increasing pressure from another car behind. I eventually had to yield 9th place after some very close but also very fair racing. I returned that pressure in the last two laps, but ran out of time, coming home 1/2 a sec behind in 10th.